The village of San Martin de las Flores huddles behind a series of clambering hills. Although linked to Guadalajara by a twisting, rocky road, the geographical remoteness of the community gives it a distinct cultural identity. The area is best known as the annual setting for dramatic performances of the Passion, where local volunteers reenact the trial, flagellation and crucifixion of Jesus Christ, aided by liberal splashings of cinematic blood. Yet it wasn’t the town’s dramatic Catholic rituals that attracted me but its reputation as a cradle for witchcraft. It’s known as the best place to remedy curses, find supernatural healing or put hexes on enemies. I came looking for a simple limpia, or spiritual cleansing, a rite with pre-Hispanic roots that often incorporates prayers to Catholic saints. A local shopkeeper told me that for an expensive but truly effective ritual, Dr. Jesus was the best in town. Vicente Fernandez, the iconic ranchera singer, had apparently been a client. A short bus ride up the mountain brought me to my destination, a spacious orange house overlooking the town. The secretary at the door told me to take a seat. The doctor would call me through. Pictures of local wrestling stars adorned the bright walls. When I was summoned into his office, a stocky white-haired man stood to greet me with a smile. I explained that I was a journalist and offered him my card. “Can you tell me about the kinds of magic your practice?” I asked. “I’m a medical doctor,” he replied with a blank expression. “But I was told you perform limpias,” I insisted. The doctor looked puzzled and pointed to the framed medical certificate hanging from the wall. My follow up questions were now irrelevant, so I tried improvising. “What about the wrestling pictures?” I asked. “I have lots of customers who work as wrestlers,” the doctor relied cheerfully. The medical certificate certainly looked real but I still have doubts about his denial. His clinic was only open on Tuesdays and Fridays, traditional days for magic rituals. Apart from the shopkeeper, I also spoke to a woman outside the building. The victim of malicious rumor? Or a witch with a medical degree? Either someone’s tried to discredit the doctor or he himself wanted to keep his sorcery a secret. In either case, we can conclude that witchcraft is still stigmatized in Catholic Mexico. Reverting to plan B, I headed to a place where magic is more openly practiced: San Juan de Dios market in central Guadalajara. A vast indoor labyrinth, the market offers a haphazard infinity of goods: from shoes to budgies, jewellery to spices, laptops to neon-lit Virgins. I negotiated my way through a long series of food stands, where cooking smells compete for the air, and made my way to the ground floor, in search of esotericas: religious, spiritual or occultist objects. Janeth Maria Perez has spent 20 years selling such items, and keeps her stall stocked with an eclectic collection: magic soaps and potions, incense, candles, statues of folk saints and crucifixes. I asked her if she knew anyone who could perform the cleansing ritual. A market stall selling magical objects, or esotericas. “It’s 300 pesos,” she replied. She invited me into a cramped space behind the stall and told me to stand with my arms away from my body. She brushed my head, legs and torso with a handful of rosemary plants while muttering a prayer under her breath. She asked me to turn around and sprayed a generous amount of perfume, before giving me an amulet with a picture of Saint Benedict. The whole process took less than five minutes. Janeth promised the ritual would help me in my relationships and at work, as well as protect me against sickness or bewitchment. According to Janeth, about 3 people come for cleansings a day. At 300 pesos (US$ 20) a turn, she makes a daily average of 900 pesos (US$ 60), a tidy profit for a witch. Sales of esotericas are also booming. The most popular items are the Santa Muerte (Saint Death) statuettes, little skeletons in bridal dresses that hold a scythe in one hand and a globe in the other. Often described as a narco-cult, Santa Muerte has a broad appeal, and is in fact the fastest growing devotion in the Americas. Followers come from a diverse range of backgrounds but the saint has gained particular ground among Mexico’s poor, despite being condemned as satanic by the Catholic Church. Another widespread magical tradition in Mexico, Santeria, is actually of Cuban and African origin. The religion merges the worship of West African deities, known as Orishas, with the veneration of Roman Catholic saints. Rumored to be popular among the political class, jailed union leader Elba Esther Gordillo is said to be a practitioner. The wife of former President Fox is even rumored to have added a Santeria potion to his coffee to convince him to marry her. To learn more about the magical art, I visited the home of a palero santero, or Santeria priest. Manuel is a Mexican lawyer and freemason, who was encouraged by senior members of his fraternity to seek esoteric knowledge in a variety of spiritual and magical systems. He discovered Santeria seven years ago and travelled to Cuba for an intensive week-long ordination ritual. Manuel gives consultations dressed in a blousy white shirt and pajama style trousers. The incense-filled room is filled with paraphernalia: cigars, candles, shells, beads, statues, fruit, rosaries. On a table was a crucifix submerged in a bowl of water, surrounded by a dozen glasses representing his dead ancestors. 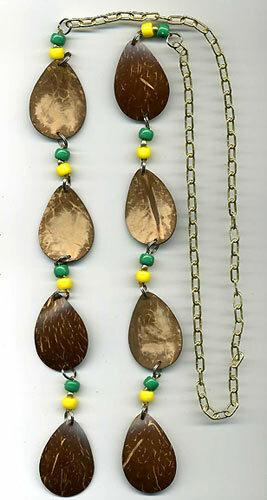 A divination chain, or opele. To take my reading Manuel cast a chain of sixteen coconut shells, light on one side and dark on the other, onto the floor. There are 256 variations to the pattern in which they fall, each representing a specific sign. The arrangement of the shells allowed Manuel to divine messages from the proverbs associated with each sign. This meant he could dispense advice relevant to my current energy pattern, which changes every 20-30 days. I was instructed to steer clear of alcohol, avoid arguments, be careful of malicious gossip and keep religious symbols close at hand. I followed the recommendations closely but found them to be very general in nature. It’s impossible to say how much they helped me or whether the advice came from the gods. As well as offering readings of the future, Santeria can also offer a way to alter it, through offerings, altar building, trances and animal sacrifices. Certainly it must be reassuring to believe that wealth, health and love can be procured through magical rites. What attracted Manuel to Santeria was the animism of the religion, its belief that a spiritual essence pervades nature. This entry was posted in Spirituality and tagged Aztec, Cuba, Elba Esther Gordillo, Magic, Saint Death, San Juan de Dios, San Martin de las Flores, Santa Muerte, Santeria, Spiritual Cleansing, Witchcraft. Bookmark the permalink.